When I received an enthusiastic invitation from Keweenaw Adventure Company (pronounced kinda like Kee-wah-naw) to partake in a sea kayaking tour in exchange for writing a blog, I answered an even more enthusiastic “Yes!” (truthfully, it was more like “Yaaaaaasss!”) Wow, I was finally going to dip my paddle in the waters of the famous Lake Superior, the largest of North America’s Great Lakes. This was a pretty big deal for me. And if I had to use one word to describe my experience? Friggin’awesome (that’s one word, right? It is now). Finally, I’m paddling on Lake Superior! I strive to surround myself with good people in beautiful places doing fun things. Let me tell ya. . . Keweenaw folks are good people in a beautiful place doing fun things:) The take-away message here is Keweenaw Adventure Company is amazing. Copper Harbor is amazing. Lake Superior is amazing. 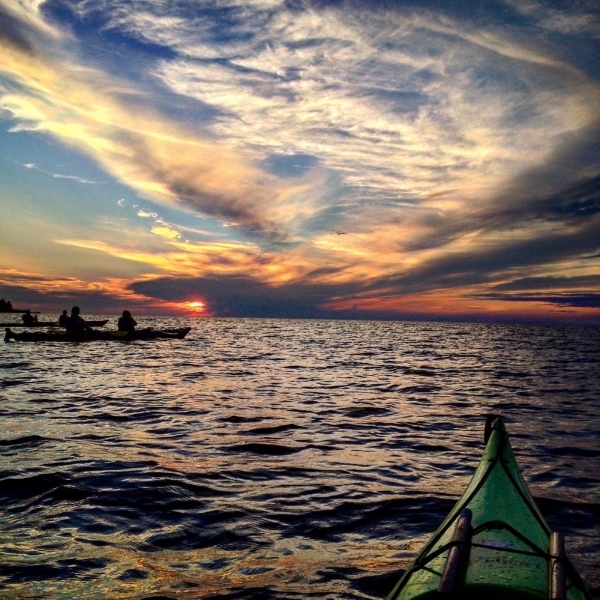 Sea kayaking on Lake Superior in Copper Harbor with Keweenaw Adventure Company is amazing. Guided sea kayaking day trips, overnight camping and kayaking trips to Isle Royale National Park, kayaking lessons and rentals, mountain biking tours and rentals, vacation rentals, shuttles, retail shop, and more. Visit their website. They also offer Group Adventures (youth groups, scouts, camps, staff retreats, and yoga/wellness retreats). Any group of 8 or more receives a 15% Group Discount. The more the merrier! They also have a great adventure blog. Check out A Kayaking Yoga Routine, from Keweenaw staffer and Michiganer (artist, musician, and yogi), Lena Wilson, the first person who I met upon my arrival to the Keweenaw Peninsula. She graciously served as my personal tour guide during our drive, regaling me with fun Michigan facts, and making the necessary visit to the renowned Jampot, where I purchased some truly divine gifts for my parents. . . and myself. Industrious monks from this Byzantine Catholic Monastery make jams, jellies, preserves, and impossible-to-resist baked goods and fruitcakes using the finest local, regional, and organic ingredients. They offer a surprisingly large selection of baked goods soaked in liquor. I guess they know what sells:) A must-stop if you’re driving the Scenic Highway M26! Let’s take a closer look at what makes this place unique, shall we? Fun facts: Copper Harbor is the northernmost town in Michigan, located on the Keweenaw Peninsula, which juts into Lake Superior. The Keweenaw Peninsula is the largest and northernmost county in Michigan, and the least populated. It is believed that “Keweenaw” is a Native American word that means “portage or place where portage is made”. Copper Harbor, the name alluding to its’ former role of shipping copper mined from local deposits during the mid-19th century, is the farthest away you can get from an Interstate Highway in the lower 48. How cool! Lake Superior is generally considered the largest freshwater lake in the world by surface area (31,700 square miles), which is 10% of the earth’s fresh surface water. Fed by over 200 rivers and containing 2,900 cubic miles of water, it is the third-largest freshwater lake by volume in the world, and the largest by volume in North America. With 2,726 miles of shoreline to explore (including over 400 islands), it is also the cleanest and the clearest of the Great Lakes (underwater visibility averages 27 feet, and can reach 100 feet!). One more fun fact, which blows my mind: Waves of over 40 ft. in height have been recorded on Lake Superior (all the more reason to hire an experienced guide)! Don’t worry, the good folks at Keweenaw Adventure Company wouldn’t dare take you out in those conditions. Keep it local! Copper Harbor has no chain businesses. None. Zero. If you’re looking for a picturesque place with an off-the-beaten-path local vibe that offers fun adventures for the whole family, lovely accommodations, great restaurants, brewpubs, and artisan shops, you’ve arrived (scroll down for my top finds). This place is on point! With a year-round population of 80 that swells to a few hundred in the summer months, Copper Harbor offers a unique escape into Michigan’s Upper Peninsula, a place renowned for breathtaking wilderness and intriguing local culture. I need to go back to delve deeper into what makes a Yooper a Yooper (someone born and raised, or accepted as a transplant to the Upper Peninsula), because Yoopers sure are proud of who they are and where they come from! View of Copper Harbor from the Brockway Mountain Overlook. (C) Keweenaw Adventure Co.
Copper Harbor is known as the gateway to Isle Royale National Park, which is the largest island in Lake Superior at an impressive 207 square miles, and one of only 2 of the nation’s island national parks. Apparently, Yellowstone National Park receives more visitors in a single day than Isle Royale does in an entire season! Unfortunately, I didn’t get to paddle here (frowny face), so I’m already scheming a trip for the future. From what I’ve heard Isle Royale offers some of the best wilderness kayaking in Michigan. I’ve pored over enough photos to confirm this claim. Who wouldn’t want to kayak past some of the oldest exposed rock in the world! No vehicles are allowed on the island, so hiking and boating are the only options to explore the more than 150 miles of shoreline, numerous barrier islands, and fjord-like bays. These are best explored in a sea kayak with a local guide. The island is teeming with flora and fauna; eagles, loons, many species of birds and waterfowl, as well as wolves, moose, and otters. This will be me someday paddling at Isle Royale, (C) Keweenaw Adventure Co.
Now that I’ve regaled you with fun facts about the location, here’s a run-down of what I actually did during my 4 days of fun in Copper Harbor. Because if you’re going to trek all the way out to this small town, you might as well stay a while and go local; sample the best of nature and adventure with the various tours offered by Keweenaw Adventure Company, and hit up some of these other spots too! Acquainted myself with the wonderful staff of Keweenaw Adventure Company, met my guide, checked out the kayaks and gear, and settled into my cozy and private accommodations at the Chalet Adventure Lodge, next to the company shop. They offer seasonal and different styles of cozy accommodations (cabin, house, cottage, chalet) in Copper Harbor. Fully furnished and equipped, I thoroughly enjoyed my stay here. Went sea kayaking on Lake Superior. I chose the Bare Bluffs day tour, enticed by sea stacks and sea caves. Although sunny, it was a bit blustery, so Matt and I turned back a tad early before the waves could build up too much. I loved the interesting shoreline and did get to see a few sea caves and the sea stack in the distance. Part of what made the trip so great was getting to know yet another quirky kayak guide:) Luckily, guides always have calm paddling spots up their sleeves, so we explored a serene slough, beautified by the reflection of vibrant fall foliage, as I described sea kayaking in Alaska to Matt. As an avid sea kayaker and guide I could immediately see the truth in everything that I’d heard of paddling on Lake Superior; it’s a gorgeous world-class paddling destination. It offers kayaking for all abilities, from flat and glassy, to big waves that only the most experienced “storm chaser” paddlers seek. . . and everything in between. Sea Stack on the Bare Bluffs Day Tour, (C) Keweenaw Adventure Co. Enjoyed an afternoon of hiking on the Copper Harbor Trail System. Due to guiding commitments in Alaska, my trip to Michigan took place in October, a lovely time of year to enjoy vibrant fall colors. (I got to enjoy 3 falls; Alaska, Michigan, and Philadelphia.) On my way to the trailhead I passed a lovely community garden surrounded by apple trees. I hiked for miles, undisturbed and at peace (I hardly saw anybody else, except for a few mountain bikers). Learned about mountain biking in Copper Harbor, the “Moab of the Midwest”. The Copper Harbor Trail System, which boasts over 40 miles of marked and mapped trails is designated for hiking and mountain biking. I had no idea that Copper Harbor is such a hotspot for singletrack mountain biking! Apparently it’s some of the most unique, scenic, and thrilling mountain biking in Upper Michigan. The area won the prestigious “Silver Level Ride Center” designation from the IMBA (International Mountain Bicycling Association), and has an ever-growing community of biking enthusiasts who dedicate thousands of cumulative hours each season to maintain and create trails, as well as promote eco-tourism to the area. Keweenaw Adventure Company is a major supporter of the Copper Harbor Trails Club, which is now recognized as a “model club” on both the regional and national level. In fact, the owner of the Keweenaw Adventure Company, Sam Raymond (avid mountain biker), helped to formally establish the Trails Club, and has personally dedicated 1000s of sweaty hours to building trails. Good people doing cool things. Next time I visit I’m going to do some mountain biking with one of their guides! “Moab of the Midwest” (C) Keweenaw Adventure Co.
Did yoga in the forest. I don’t normally photograph myself doing yoga. In fact, it would never occur to me to document such a thing. However, for the purpose of this blog, here you go:) Beautiful and peaceful places abound in this area for exercise, yoga, and healthy living in general. The air is fresh, crowds are easily avoidable, and nature-based activities pervade the community. Besides, visitors from more populous areas may have a slightly different notion as to what defines a crowd. Caught a gorgeous sunset from Brockway Mountain. Wow! This was a highlight, and a short drive from town. The scenic road is 10 miles long, with many pull-offs to take in the views. At the top you’ll be rewarded with a 360° view of Lake Superior, the surrounding woodlands, and inland lakes. At 735 feet above the lake, you can see Isle Royale about 50 miles away. Next visit I want to catch a sunrise here. Ate a Lake Superior Whitefish sandwich at the Mariner North restaurant. Visiting a new place always includes indulging my taste buds in the local fare, as well as learning about the food heritage of the area. Lake Superior is home to about 88 species of fish, including carp and varieties of trout, salmon, and perch. I’ve heard they’re all delicious! Fish from the lake are rich in omega-3 fatty acids because the lake is very cold and deep. Hundreds of years ago the Ojibwe and Chippewa Indians hunted Lake Superior trout, whitefish, and sturgeon from birch bark canoes using nets crafted from willow bark. European settlers began to arrive and commercial fishing was born as a result in 1820. Due to the usual culprits of pollution, over-fishing, and introduction of invasive species, trout and whitefish numbers severely declined and by the 1950’s the heyday of this commercial fishery was over. Currently, there are strict regulations to limit commercial fishing in Lake Superior. Introduced a new friend to packrafting at Hunter’s Point Park. For those who have sat in a packraft, it’s a pretty tight ride. But I only had one raft and we needed it just for a short crossing to a small island. It was in the name of exploration! Hunter’s Point Park is a beautiful area with a few trails that follow the shoreline of Lake Superior. Great for birding, as well as abundant flora (wildflowers, mushrooms, lichen, mosses, and cedars, hardwoods, and pines). The geological formations are especially unique here. The basalt in this area is the oldest rock on earth. Consider a visit here like a window to the past. Took a stroll on the Cathedral Grove Trail at Estivant Pines Nature Sanctuary, which is home to the oldest stands of virgin White Pine trees in Michigan. Owned and cared for by the Michigan Nature Association, the sanctuary has two short and easy trails that feature pines that are more than 100 feet tall and 200 years old. There are also Maple, Birch, and Cedar trees. I was there in the fall and got to see a bounty of mushrooms in many shapes and colors. In the summer and spring you can see many rare fern species, as well as orchids and other delicate woodland plants. Grooved to the juke box at Zik’s Bar with the endearing couple who own and operate Keweenaw Adventure Company (Sam and Shelby). Is it sacrilegious to have spent even a few hours in Michigan without drinking beer? I think so. I’m guilty. I just don’t like beer. However, I did drink wine at this fine local establishment. This is the place to be if you want to check out the Copper Harbor nightlife, while being immersed in local history, as the walls are covered with photos and memorabilia depicting local lore. Copper Harbor has at least one microbrewery called Brickside Brewery, which I did not visit. Next time. Even though I’m a sea kayaker who went to Copper Harbor to go sea kayaking on Lake Superior, I came away with far more experiences. It was an unexpected whirlwind of meeting some of the most warm-hearted people I’d ever met. I made new friends and connected with people on a level that made me feel like I was visiting old friends. I discovered an adventure company that strives to keep things local, human, and sustainable. Agate Harbor Day Trip, (C) Keweenaw Adventure Co. Spreading a bit of Alaska Glacial Facial love to new friends, Matt and Gabbey. Cheers! Don’t forget to check out my website for upcoming summer sea kayaking trips in Alaska and Croatia. . . or if you’re one to plan well in advance, in Panama for next “winter” season.